Philly’s 4th Annual Briscoe Awards! Philly Boxing History’s John DiSanto ran his 4th Annual Briscoe Awards for Philly boxer’s outstanding performances in the year 2010! It was before a packed house Monday night (the 10th of this month) at the VBA Club which is the oldest in the United States, held at the Port Richmond section of Philadelphia. 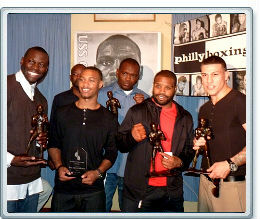 It’s a time when all those associated with Philly boxing take the time to honor those who stood out in the previous year. For the second time former two-time IBF cruiserweight champion Steve “USS” Cunningham won the Philly “Fighter of the Year” award. His title defense stoppage over top rated Canadian Troy Ross in Germany proved to be enough to warrant this prestigious “Bennie” in the honor of the late “Bad” Bennie Briscoe. The foot high bronze statue stands for the “Philly fighter” and no one stood out like the late two-time title challenger. Cunningham gives back to the community with the help of his manager and advisor Livvy Cunningham. As his wife she is there to represent him without the need to enter the spotlight. It was just 9 days prior to this Cunningham was unjustly deprived of his IBF title for the second time. “I want to thank my Lord and Savior Jesus Christ for without Him I could not achieve what I have. We have a grievance with the IBF officials to get an immediate rematch if not a reversal of the decision. Next time I will knock out my opponent so there’s no doubt who the winner is,” said Cunningham. The award for Philly’s “Fight of the Year” in 2010 went to USBA champion Derek “Pooh” Ennis and newly crowned PA state champion Gabe “King” Rosado. This does not necessarily go to two Philly fighters but this year it so happened to work out that way under the promotion of Peltz Boxing at the South Philly Arena. For 12 rounds both fighters had the fans either on the edge of their seats or standing with Ennis taking a majority decision. It was a night to remember! “It’s an honor to win this award,” said Ennis. His father/trainer Derrick “Pooh” Ennis was in attendance along with co-managers Moz Gonzalez and Eddie Woods. “I want to thank God and my trainer Billy Briscoe who though only in his 30’s has the knowledge of a much older trainer,” said Rosado. It was Briscoe’s second boxer to be in the fight of the year. Both boxers spoke out that they would like to get the call for a big fight in the near future. Both are in the IBF world ratings. As founder for the Briscoe Awards, John DiSanto decided this year to give a special tribute to a Philly boxer who was acknowledged as the winner in the “Upset of the Year” given to Philly’s own Dhafir “No Fear” Smith. In December of 2010 Smith traveled to the back yard of former Olympic Gold Medalist and former IBF/IBO super middleweight champion Jeff “Left Hook” Lacy in St. Petersburg, FL. “I want to thank John DiSanto and Team Shuler (Shuler’s Gym) along with my trainer Buster Custus for this award,” said Smith. Custus runs Shuler’s where Cunningham, Yusaf Mack, former IBF champion Rob “Bam Bam” Hines and cut-man Willie Folk among others attend to business. At the young age of 29 Smith has fought 53 fights in at least 16 states and the countries of Canada and Russia. All 4 boxers received “The Bennie” while a yearly special award is given to the outstanding amateur by the Everett brothers, Eddie and Mike in honor of their late brother Tyrone. “This award is given to Damon “Baby Dame” Allen who is now part of the Everett family,” said Eddie Everett. Tyrone Everett was 36-1 (20), and lost the most controversial decision this writer has ever witnessed, and in person, in November of 1976 to Alfredo Escalera for the WBC super featherweight title. Allen is a 4-time national champion with over 100 amateur bouts and was part of the Northern Michigan University boxing team. His father Damon Sr., Dave Price and great grandfather Mitch Allen were all in attendance along with mother Rasheeda Gantz, a USA boxing judge. “I want to thank Mr. John (DiSanto) and the Everett brothers for this award,” said Allen. He was the Silver medalist at the 2010 National Golden Gloves. Those in attendance besides already mentioned were WBA bantam champ Jeff Chandler, Henry “Toothpick” Brown, USBA cruiser champ Garrett Wilson, USBA Lt Hvy champ Yusaf Mack, Chuck “Diesel” Maguire, Greg Hackett, Sidney “Sweet Pea” Adams, Gee Cullmer, Billy Abel, VBA Pres. Charley Sgrillo, VBA VP John Gallagher, J Russell and Linda Peltz, Brittany Rogers and parents, Fred Druding along with referee Steve Smoger and judge Joe Pasquale along with refereeVic deWysocki who filmed the event. Press in attendance George Hanson, Jack Obermayer, Rich Pagamo and Marc Abrams. Gary Purfield was among the photographers and supplied almost 200 pictures of the event. He can be reached at gpurfield3@gmail.com Thanks to John DiSanto and his wife Jennifer who put in countless hours in events such as this for the betterment of boxing!